Netizens are showing great deal of concern towards MBC drama series The Moon Embracing the Sun that is about to end on March 14th, 2012 with happy ending. At the time when the drama that achieved over 40% audience ratings about to come to an end, audience discusses about the series on the Internet one after another. But it’s expected that The Moon Embracing the Sun will be faithful to the original novel, and will not have major change or reversal on the plot. The clue lies in the accidental spoiler revealed by Korean Folk Village when revealing the filming schedule of the TV series, which said that ‘Seol is killed while protecting Yeom.’ Prior to that, there was already hint that the content of TV series will be faithful to the original novel. Thus, the plot of warrior guard of Yeon Woo (played by Han Ga In), Seol (played by Yoon Seung Ah) dies for Yeom (played by Song Jae Hee) whom she unrequited loves, will not have significant change. Although the spoiler for the ending was revealed in advance, producer used to considering to change the plot, but due to busy schedule, the ending may be shot as originally planned. What’s the most concerned by most people is whether the ending for the love between Hwon (played by Kim Soo Hyun) and Yeon Woo will be played out according to the novel, wrapping up in a happy ending, where Yeon Woo recovers her memory, becomes the queen, returning to the position that supposedly belongs to her. The last scene of The Moon that Embraces the Sun will be the ceremony of Queen Yeon Woo ascending the throne. 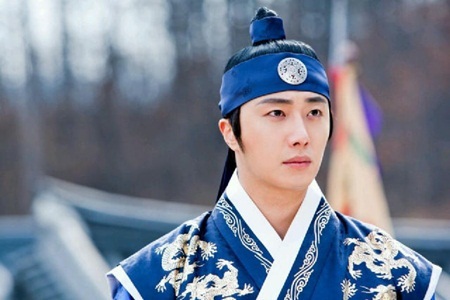 Hwon gets back the Yeon Woo whom he longed for, and also regains the smile of happiness. But the fate of his half-brother Prince Yang Myung is relatively miserable. According to original novel, in the end, Yang Myung is stabbed to death in order to protect the king. After debuting with the rating of 18%, the drama constantly refreshes the highest ratings record, and breakthrough 40% ratings mark at episode 16. Related persons agreed that the main contribution factors for the popularity of the drama are rich story plot of original script and the realistic performance of the actors. The image of protagonists in the drama is very much in line with the original novel, contributing a great deal in attracting viewers. In this case, it’s not necessary for the production team to arrange for reversal of the plot, so it will continue to be faithful to the original novel.